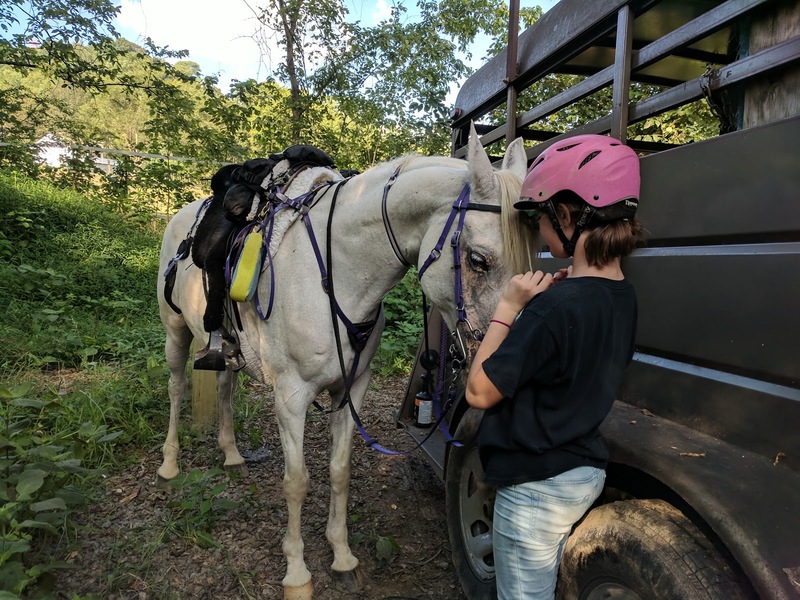 On Monday, my niece came out to ride Sasha. With Tanna and Serts retired, I don't have any horses where we can both go out and ride. So Lillie has been missing riding. 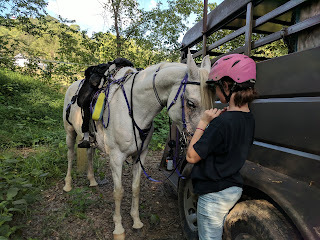 She saddled Sasha and rode on our property. Sasha pauses for a bite unloading at the trailhead. I was scheduled for a 5 mile easy run, but I decided to take Sasha out for a workout instead. We normally do 18-20 miles when we go out, but I gave her a break and we just did 10 fun miles. She enjoyed the freedom to go her own speed (as long as it was safe). After I got home, Daniel wanted to go to town, so we went shopping (Lowes, Northern Tool, Harbor Freight), then to one of our favorite Mexican restaurants. 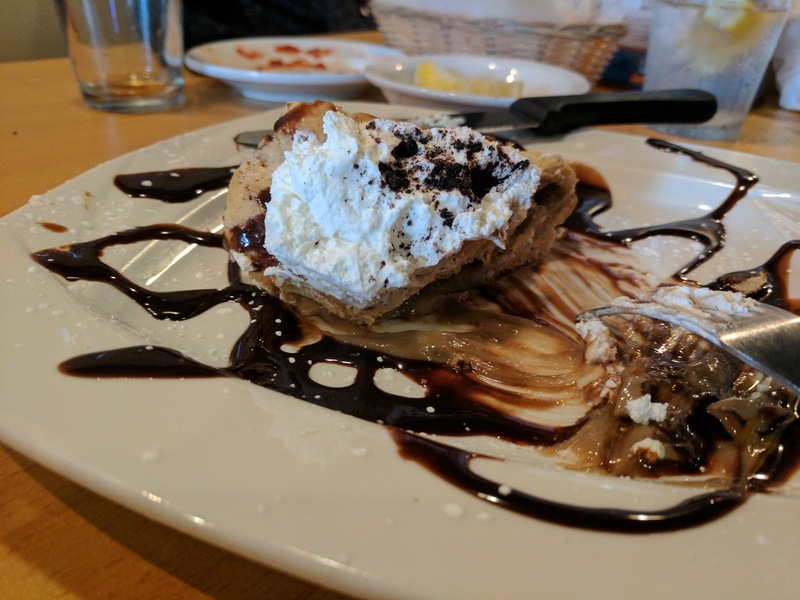 They have the most yummy dessert: cheesecake wrapped in tortilla, fried and sprinkled with cinnamon and sugar, served with ice cream and all of it drizzled in chocolate syrup! No idea if it's actually Mexican or not, but super yummy anyway! 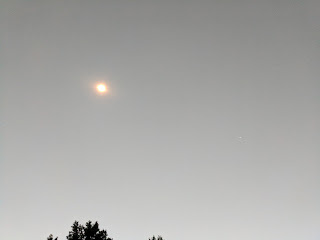 I thought it was awesome to see other stars and planets in the middle of the day! Eclipse day!! I lost my driver's license over the weekend so we went to the DMV to replace that. Then out to join our family with a bunch of school kids to watch the eclipse. We were in the path of totality and got to see the total eclipse for just over a minute and a half. It was so cool to watch and see the excitement of some of the kids. We got to see shadow snakes and the corona of the sun as well as solar flares. Super cool! Then my niece came home with us to ride Sasha and when we returned her to her family, we had dinner with them. Such a full day. When to run?? At 5:30 AM, of course. I got up and hit the treadmill. I usually prefer to do my substance workouts outside, but there was no time for that. It was treadmill or skip it. I normally do my tempo runs out at River Park. So I used my iFit subscription to draw out the same course I would run if I was actually at River Park. I set it to a warm-up pace for the first mile, tempo pace for the middle 5 miles and easy pace for the last mile. My treadmill has incline and a -3% decline, so it changed incline fairly appropriately for each stage of the run. When it was going downhill, I bumped my speed up, just like I would if I was out there for real. When going uphill, I made sure I was only going tempo pace. Outside, I go a bit slower uphill, so overall, my treadmill run was easier than doing it outside. But it was a good workout and I got to enjoy the rest of my day without feeling guilty that I didn't get my run in. This was an easy run. I had to do some errands in Spring Hill, so I popped over to Thomspon's Station Park to get 6 miles in. I haven't run over there in a few weeks, so it was the first time I saw the sign changed. 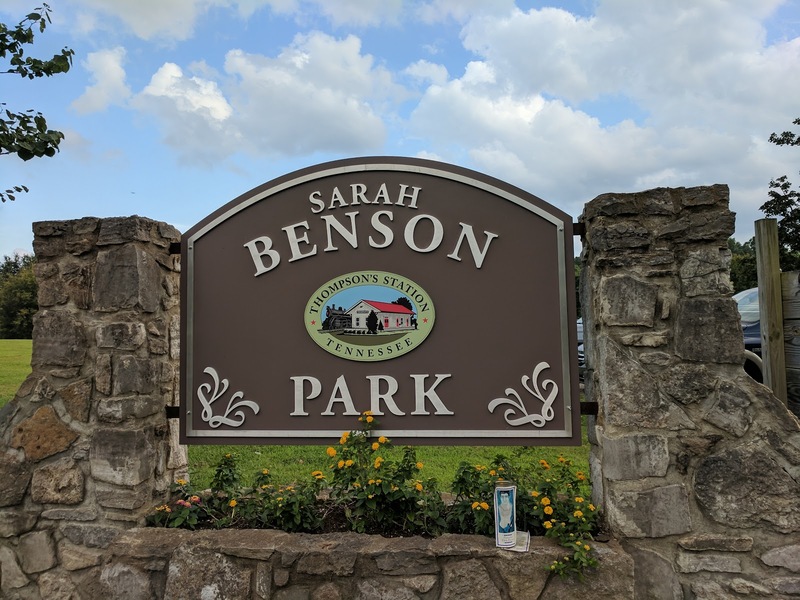 The park has been renamed to Sarah Benson Park. Not sure if I'll be able to make that switch in my head, but we'll see. The gravel circular path is about 9/10ths of a mile. I ran that a full time before heading in the trail part of the park. I ran back there for about 4 1/2 miles, then came back out front to finish out my run. With a good bit of elevation on those trails, I wasn't able to churn out a fast pace, but it's all good on trails. I was just happy I didn't twist an ankle or face-plant. Mushroom I saw along the trail. Out to Bowie Nature Park. One of my happy places whether on foot or on horseback! Although lately, it's been mostly on foot. I missed my long run last week, so I was pleased to be back. I ran the Perimeter trail clockwise, then my inner trail, then the Perimeter trail again, counter-clockwise. 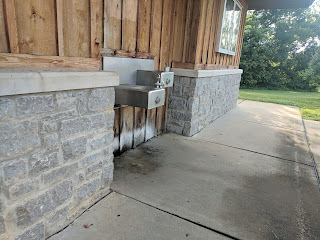 That would have been about 12 miles, but around mile 5, I popped down to the restroom and to refill my water bottle. The temp wasn't too bad at 74°. I took a gel at mile 4, mile 7.5 and mile 10. I did easy effort for the first 6 miles, then moderate effort for the next 3, and finally allowed my HR to just reach lactate threshold for the last 3.5 miles. It was a decent run. My hips and glutes and lower abs were sore for the next two days. I wore very bright shorts! 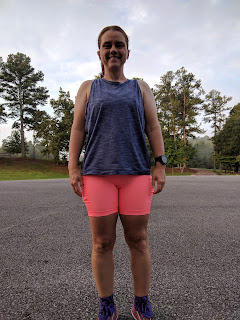 I had to replace my running shorts with a smaller size and ended up with 3 pretty bright colors! I wanted to get the same style with the nice big side pockets, but lululemon stopped making them and pink, peach and aqua blue were the only colors I could find to buy in my size. I decided to go ahead and buy them since I like the shorts so much and I was worried I won't be able to find any in the future. 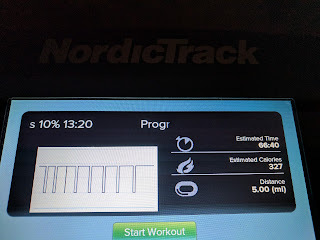 An unexciting easy treadmill run. I reworked my treadmill run to have me running longer. I still did run/walk at the same ratio as normal, but I bumped up the distance of each interval by 15% each time instead of only 10%. That had me running longer pretty quickly, but also gave me longer walking breaks. It also had the advantage of messing with my mind so I didn't know exactly when the next walk break would happen. Last week, I thought my strength run of 6x1 mile with 1/2 mile recoveries would be no big deal, but ended up tough. This week, I was mentally prepared for the badness! I also got to cut my run from 13 miles down to 10. This week was 4x1.5 mile with 1/2 mile recoveries. So 8 miles for the run and I did a mile warm up. I cut 2 miles from my cool down down to one mile so my run would be just 10 miles. The weather was super unbelievable for Middle TN in August!! About 58° when I started and only mid-60s when I finished! I was actually cold for the first 2 miles! So I can thank the weather for a better run than last week. 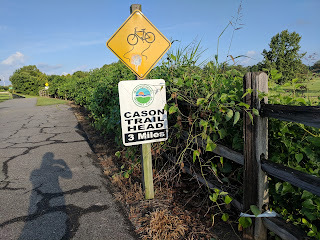 I ran down to the Cason Trailhead. I was able to refill my water bottle and visit the restroom just at the end of my recovery for my second interval. I ran my first and last intervals a bit too fast. For the last 1/2 mile of the last interval, I just ran without watching my pace on the watch and ended up doing pretty well on that one. Felt pretty good, but was ready for the recovery jog. I'm on track to have my highest mileage month of running ever. My highest so far is 167 miles in January 2017, during the height of my marathon training. So far this month, I have 140.5 miles. I've been doing Weight Watchers online since May. I've continued training and am in week 12 of Hansons beginner half marathon program. Weight Watchers Online is basically about food tracking for me. There is a section for blogging and connecting with others, but I didn't use any of that. I know how to track food, but I hadn't been doing it well. I started WW because I wanted a different way that I couldn't "game the system" as easily because I wasn't familiar with the system. Every food is given a point value. Like a half cup of 1% cottage cheese is 2 points. I get 30 points a day with some wiggle room. They want me to eat at least 27 points a day and no more than 37 points. Anything over 30 points and I start using up "extra points" that they give me. Every week, I get 21 "Weekly Points." I also get points for activities. I have it set up to take points from my activity points before the weekly points. I don't think I've ever had the weekly points used. When starting WW, I realized I wasn't fueling my runs properly because I didn't want to use the points. A single Gu gel was 4 points. So for a long run that I do 2-3 gels on would make me think twice about fueling my run. That wasn't smart for me, so I made this deal with myself. Anything I eat WHILE RUNNING is free. So gels and picky bars are all freebies as long as I consume them when the Garmin clock is running. I am only doing easy runs up to 6 miles. I don't fuel during those. I usually do those first thing in the morning and eat breakfast afterwards. Sometimes I'll have an apple or 4 oz of grapes immediately after if I have to drive home before eating breakfast. For my SOS workouts (tempo, long, and speed runs), I eat some simple carbs (1 packet of instant grits) and a little protein (1 small "sausage" patty) about 45 minutes before the workout. That I track in WW. I fuel during my SOS workout as needed. Immediately after, I eat Apples or Grapes (4 oz) or baby carrots (4 oz) or all 3 if I'm really hungry. Those are all Zero Point foods, so I don't feel guilty about eating those! Then I'm just eating normal foods the rest of the day as if I hadn't run at all. If I get hungry, I eat Zero Point foods that I like. For tracking my runs, I only track STEPS. Not the actual workout. So if I get 25,000 steps, 12,000 may be from a run, but I don't track a run and then 13,000 steps. I just track 25,000 steps, period. Every 2-3 weeks, I throw everything out and eat whatever I want for a day or two. This resets my brain, if not my metabolism. Since May, I've lost 10+ pounds and I'm not as good about tracking my food and steps in the app because I've hit my goal weight and I'm really just not too worried about it at this point. I'm still snacking pretty sensibly with lots of fruits and veggies and still eating a lot of the same foods I did when I was tracking. I'm still weighing almost every day and if I need to tighten up on it again, I will. When I first started WW, I couldn't find a lot of strategies for doing WW while training, so I just made it up as I went along. Not terribly exciting, but the picture of the week is definitely my treadmill screen! I ran the SAME workout 4 times this week! Could have been worse. I could have not run at all! Saturday night I didn't go to bed at a decent hour and Sunday I spent many hours doing household paperwork. I finally dragged myself to the treadmill before supper to get an easy run in. Monday found me at River Park for Tempo Monday. I was scheduled for a 4 mile tempo run at 11:49/mi. When I started it was raining at steady pace, but not too bad. After a half mile, the rain eased up and I thought, that wasn't too bad. I did my mile warm up and ran 2 of my tempo miles. The first mile was a tad fast at 11:43. The second was even faster at 11:25. However, that second mile has a good downhill on it and I wasn't going to hold back on a downhill, that's just silly! I took a Gu as I reached my turn-around point and headed back. And it began to rain again. Just a little at first, but then more and more until I was running in a full on downpour. My third tempo mile was a little fast at 11:36, but my fourth mile was at 10:45! Oh, that fourth mile. I kept running, but as I ran, I came out of some of the cover the trees were providing and the rain hit me full force. I wear contacts and the water was coursing down my face into my eyes, making my contacts swim. My left contact decided to hide at the bottom of my eye socket, so I couldn't even open that eye. My right contact stayed in place, more or less, but I could barely see through that eye. I think there was water between my contact and my eye. Or something. And what did I do? Why, I kept running, of course. This is a tempo run and you keep running. I managed to stay on the path and not veer or trip into the road. 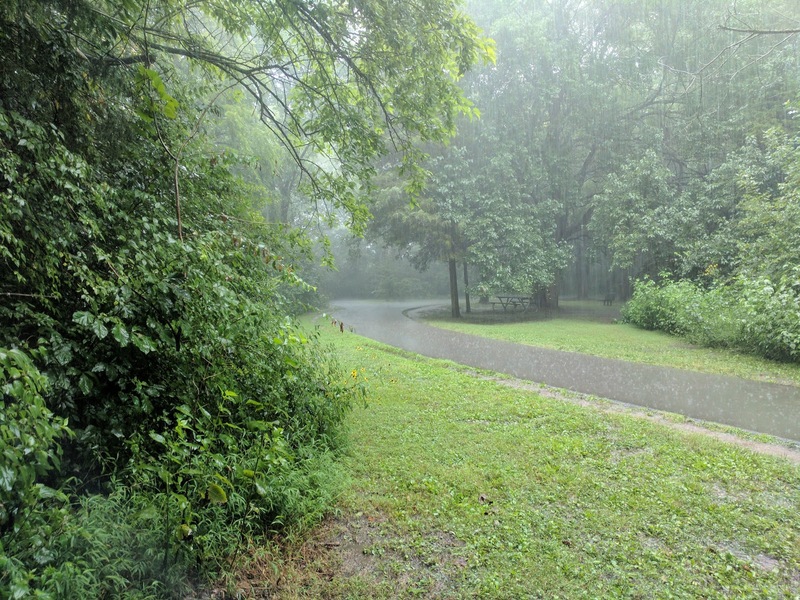 Finally, I got back into some tree cover and the rain let up just a tad. The fourth mile chimed and I decided I wanted another mile to redeem myself. It'd be nice to have at least one of my tempo miles at the prescribed pace! My left contact decided it was safe to come out and popped back into place. I blinked several times and suddenly my right contact settled and I could see again! Oh, the joy! Soaked after a very wet run! It was still raining. I ran the fifth mile in 11:32. I give up, I said. Time to do the cool down mile and call it a good run. I ran to the pavilion near my car and strangely enough, there were no other cars in the parking lot. Only crazy people run in downpours like that. I walked around for a few minutes and then stretched. I ducked back into the rain without a thought. I hadn't melted yet. I did feel bad for my car. I had a couple of towels, but I didn't take the time to change before heading home. Turned out to be a pretty good run, if a bit faster than it should have been. Another easy treadmill run. 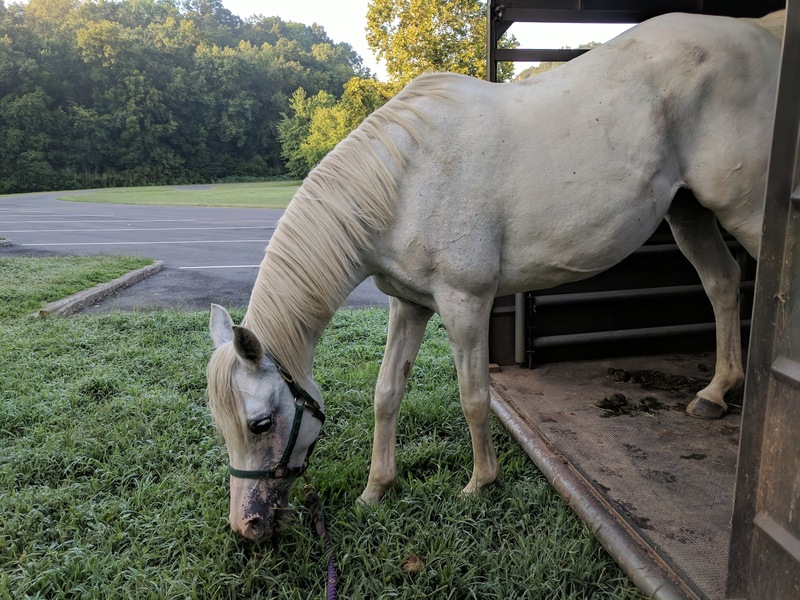 My farrier came out to the house to put shoes on Sasha, so I didn't have time to drive out to a trail. And. Another. Treadmill. Run. Ugh. 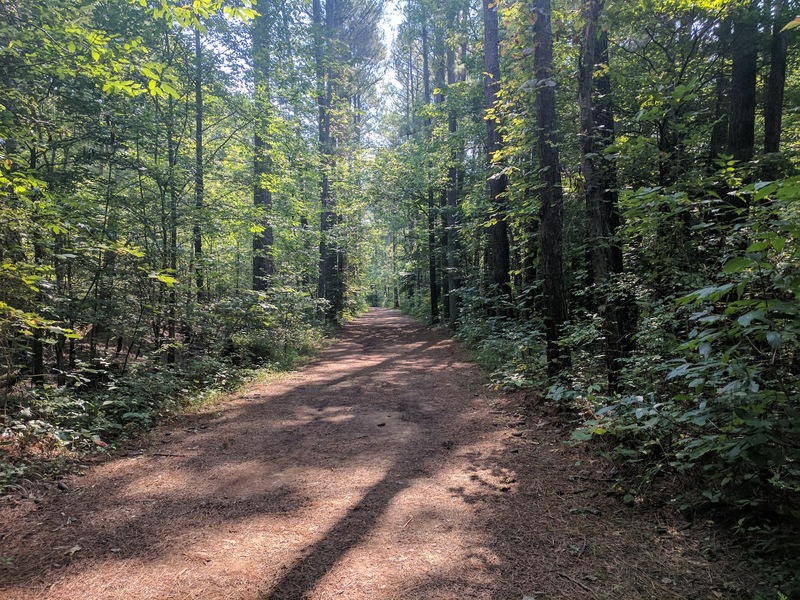 I had an early appointment and didn't have time to do my long run at Bowie Nature park. I ran the same program I do for my easy runs, but I played with the incline and was running at a max incline of 6%. I'd let it go down a half percent every couple of minutes, then bump it back to 6% when my walk interval was over and I was running again. Ended up getting just over 700 feet of elevation gain that way. Yet another treadmill run. Just the regular program. No incline changes. I'm getting sick of this treadmill program! Finally, I got to run outside again! Yay! Although, I about choked on the humidity when I stepped out of my house to go run. I went to the Murfreesboro Greenway, the scene of my speed workouts this training cycle. This workout is paced just 10 seconds faster than race pace. So my goal for each mile repeat was 11:39. Then a half mile jog between each. I did a 1 mile warm up and 3 miles of cool down for a total of 13 miles. For some reason, I wasn't scared of this workout. I'd been scared of the speed workouts, but those were all ok. 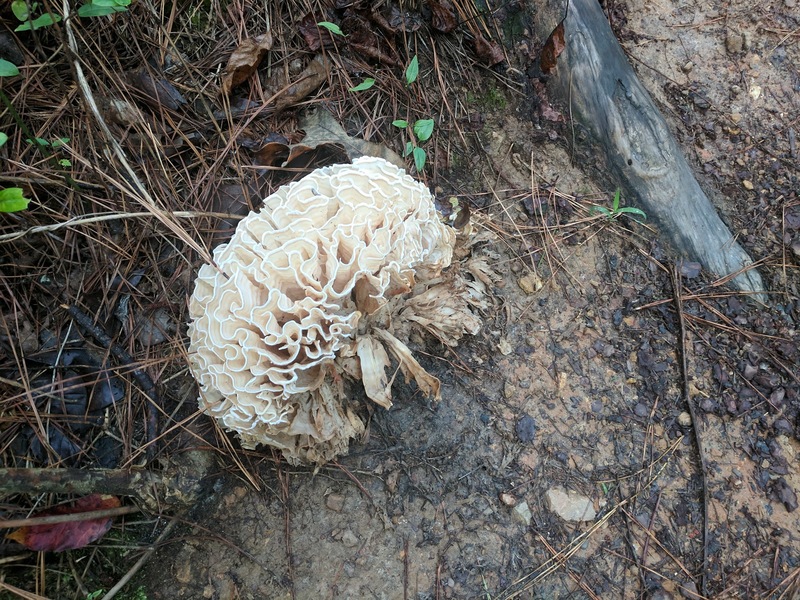 This one, though, I wasn't scared of and it was HARD. 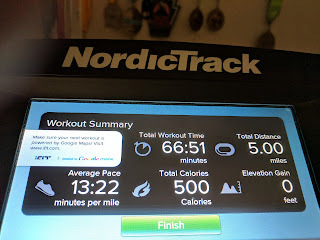 I wasn't scared of it because, after all, I'd just run 5 miles on Monday faster than I was supposed to run these mile repeats, but I didn't get that jog recovery. 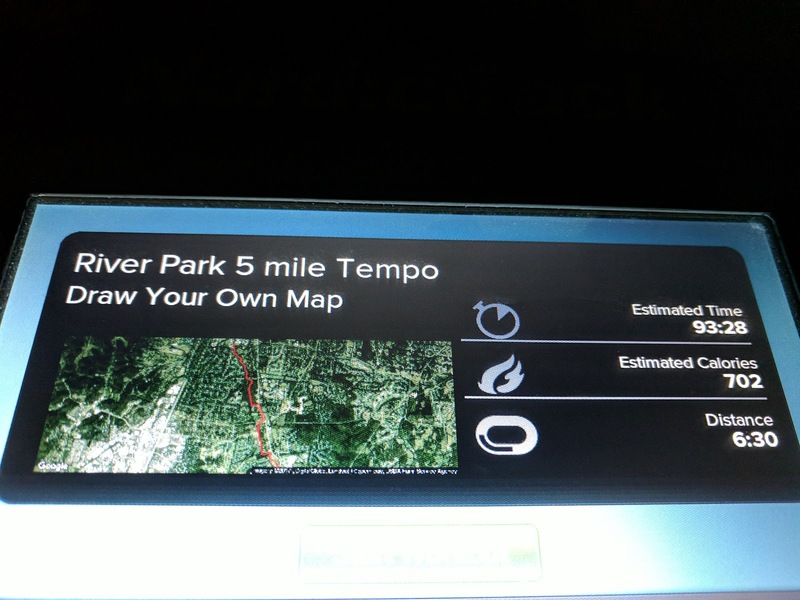 So how hard could 6 miles be? Apparently, quite. 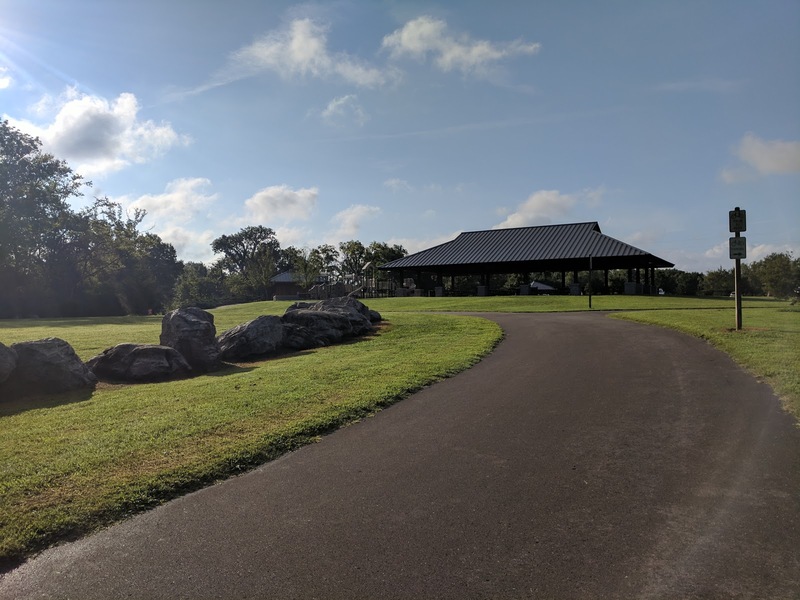 I ran from the General Bragg trailhead south to Barfield Road and back again. I finished my last mile repeat south of Old Fort Park and was dismayed to realize I still had 3 miles to run back to the truck. I was TIRED. My legs were starting to hurt. I managed to jog most of the last 3 miles, but I did drop to a walk a few times. It was the transition from running to walking that hurt the most. A lot like the last 4 miles of my last marathon. I probably didn't fuel enough for 13 miles in the heat and humidity. When I finished it was 85° and 75% humidity. I had my normal packet of grits and "sausage" patty before I left the house. I had a gel at mile 3.5, a caffeine SaltStick cap at mile 7, another gel at mile 10 and a final caffeine SaltStick just as I finished. The shorter water fountain had the most wonderful cold water!!! I did drink lots of water. I carried my larger Nathan soft flask and refilled it at the Cason trailhead both times I passed it and at Old Fort Park on the way back to my truck. I also tanked up on water when I refilled. I like the SaltStick capsules. Those have pretty much eliminated my post run headaches. But I definitely need more fuel than 2 Gus and a SaltStick cap for a 2 hour 45 minute run. My training pace is faster this week due to so much time on the treadmill. It's definitely easier for me to run on the treadmill, so I can get a faster pace. Week 11 is coming up. I'm curious to see how I handle the next strength workout. I survived the one this week; it was just harder than I expected. 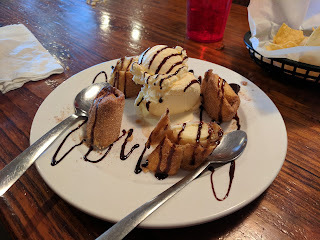 On Monday, my boss took several of the team out for lunch to the Villalba Italian Restaurant in Nashville. We had the best waiter and he brought me this heavenly puff for my appetizer. It was SO good! 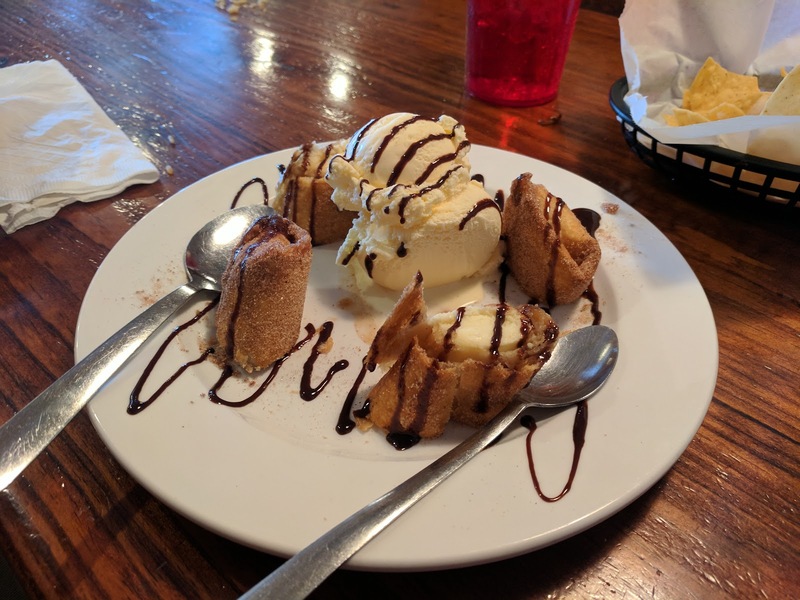 Remember, kids, always eat dessert first! You might not have enough room after the meal. I take Sabbath (Saturday) as my normal rest day. I also took Sunday and Monday this week off from running. Sunday we were out of town, so it was easier not to run, but I was getting bogged down in the running and needed a break mentally more than physically. I know that the Hansons Method is supposed to break me down a little and help me push through, so maybe I "broke" that somehow. But I'd been reading a lot of people's training recaps and got bogged down in how long it takes me to do my runs. My long runs have been 10 mile runs. I take about 2 hours 20 minutes to run that. Seeing other runners post that they do their runs in much less time got me frustrated about how long it takes me to do the same run. Because it takes SO much time out of my day. So so much. I am a slow runner. I know that. I'm getting better at running and I'm getting faster slowly. I've been running for 9 years, but only the last 2 have I gotten serious about my running and my training and if we want to get completely honest, only after my first marathon. Kinda what marathon running did to me. Made me sit up and pay attention. In order to take my running to the next level, whatever level I want that to be, I had to run more and be more intentional about running. But I'm still slow. So I decided to take a 3-day break from running and from eating "correctly." I allowed myself to not run and to basically eat whatever I wanted. Since we were out of town part of the time, I actually didn't take full advantage of the eating thing like I thought I would, but never mind, it was nice not to have to track everything that went into my mouth. I decided to skip my 5 mile easy run and my 4 mile tempo run for this week and just pick back up on Tuesday with my easy run. My first run was on the treadmill. 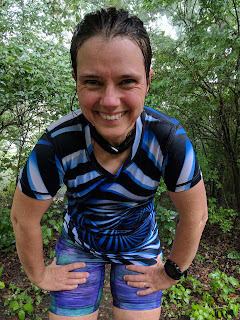 We have a lot going on right now and I decided I didn't have time to drive to a trail for my easy run. So I hopped on my trusty treadmill. 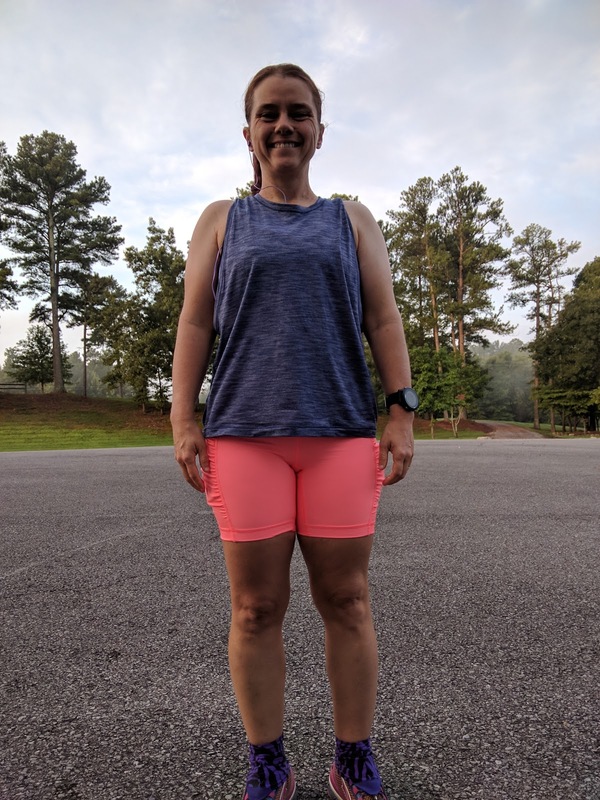 I did my run/walk workout where I run at 12:30/mi for about 1/3 of a mile and then walk for a minute or so and then go again. Each run/walk interval remains the same run/walk ratio, but gets longer by 10% each time. 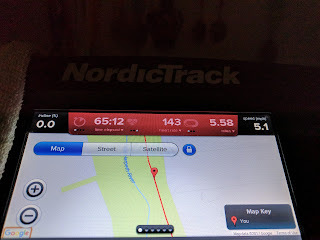 That's a 5 mile workout that I have set up on iFit, so I just tacked on an extra mile at the end of that to get 6 miles. Again, easy mode. I bumped up the incline to 0.5% just to get a little rise in my HR. One of my favorite stretches of trail. Doesn't hurt that it's about 3/4 mile before the finish of my long run! Back out to Bowie Nature Park. I really enjoy running at this park. There is some elevation and it's a trail, but I somehow feel like it's an easier run than Henry Horton that is actually flatter and more groomed trail. I think it actually is the elevation at Bowie that makes me happy. I am a decent downhill runner so I can make up time on the gentle downhills without losing too much time on the uphills. I took the morning off from work, so I got to the trail later than I normally would. It was still only 76 degrees and 70% humidity when I got done with my run. So so crazy to have these cool temps in August. I'm not quite used to it! I break my long run up into segments for effort. This time I was able to run 6 miles at an easy effort, keeping my HR under 148. By the end of the 6th mile I was having trouble maintaining pace at that HR, so I bumped my allowed HR up to 157. I was able to maintain that through the 9th mile, and only had to bump up to 166 (estimated lactate threshold) for the final mile. 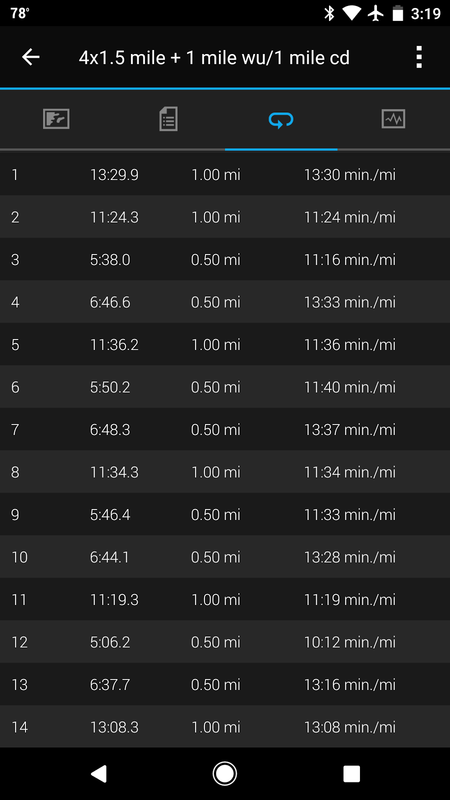 My long runs bump up to 12 miles next week, so this sets me up perfectly to be able to run the first half next week at an easy effort, then the next 25% at a moderate effort and only 25% at or just under my lactate threshold. For fuel, I had my normal packet of instant grits and a "sausage" patty before I left the house. I had a Gu at mile 4, a SaltStick capsule with caffeine at mile 6 and another Gu at 8.5 miles. I carried my larger Nathan handheld and refilled it at mile 6. I had a boiled egg and apple on the way home and ate a normal lunch at home. I did a strength workout in the evening. My only one for the week. 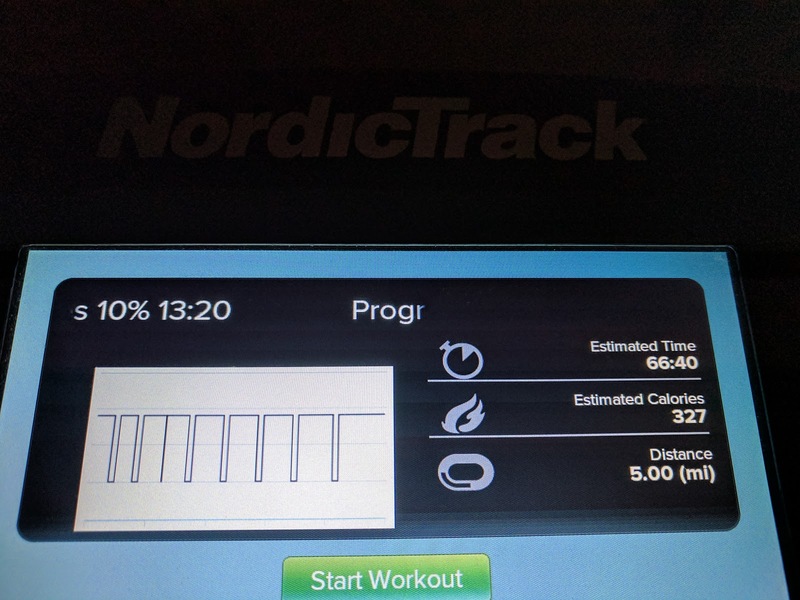 This was just a boring repeat of my treadmill workout from Tuesday. I had planned to take my horse out to ride, but I had errands to do in the afternoon, so I ran early, then worked for 1/2 a day before taking the rest of the day off to take care of things. I did have some twinges on the outside of both legs just above the ankle. I think that had to do with the strength workout I did the evening before. It wasn't bad, just a little soreness that I wasn't used to feeling there. This was my final speed workout of this training cycle. 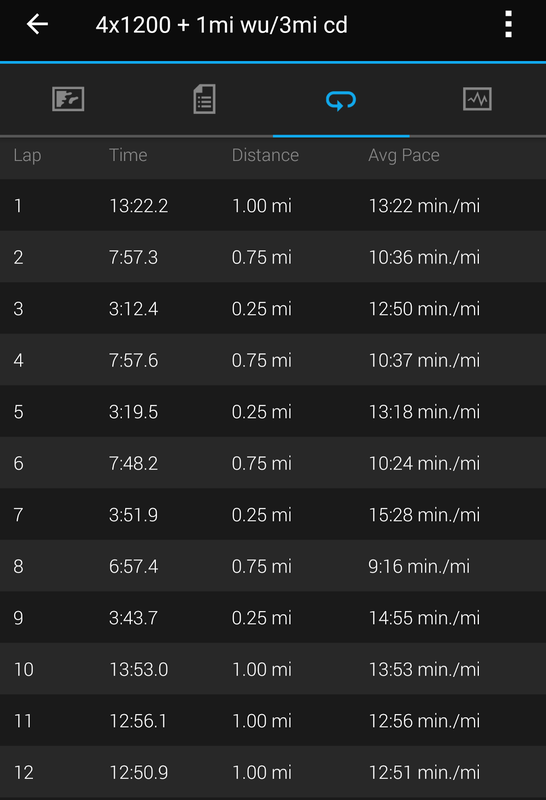 1 mile warm up at an easy jog, then 4 intervals of running 3/4 mile at 5k pace (10:50/mi) with a 1/4 mile recovery jog, followed by 3 easy miles for a cool down. I headed to the Murfreesboro Greenway. It's flat, paved and a pretty place for a speed run. 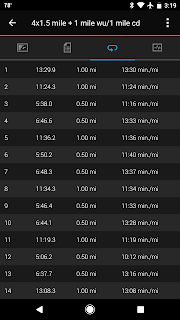 My first 2 intervals were 15 seconds/mile too fast at 10:36/mi. My third interval, I thought I'd settle down a little, but then ended that one with a 10:24/mi average pace. My left shoe came untied near the end of the 3rd interval, so I ran carefully and as soon as the interval was over, stopped to retie it. Of course, I over-compensated and tied it too tight, so a few steps later, I was retying my shoe. My last interval I decided to do the same thing I did for the previous two speed sessions. I decided to just run and see how well I could do. This was not only my last hard effort for the week, it was my last speed interval for the training cycle. Strength runs start next week at 1 mile intervals with half mile recoveries. Those are longer, but I slow down to an 11:40/mi pace for those. I ran for awhile and then it got harder about half-way through. I thought about just dialing it back and jogging the rest of the interval, but decided, nah, just go. So I did a quick body scan from head to toe. Everything was fine. No unusual pain. I released some tension in my shoulders and hips as I scanned and then began to count every other left foot fall to focus on my running. I did have music in my ear, but I don't remember what was playing. Very near the end of the interval, I was quite ready for it to stop. As soon as my GPS dinged, I slowed down and began to jog. A voice in my ear said I'd done that 3/4 mile in 6 minutes 57 seconds. I, of course, had no idea what pace that translated to, but it was a full minute faster than my first two intervals. I checked my watch and was happy to see 9:16 pace. I was actually expecting closer to a 9 minute pace, but it was fine. That was probably the fastest I've ever run a 3/4 mile stretch without some downhill help. My recovery jog was very slow, waiting for my heart rate to drop. My breathing was ok, just my HR took a little time. After the 1/4 mile recovery was over, I picked the pace up a little and did an easy jog for another mile. That was enough recovery time and I was able to quicken the pace a little for my last 2 miles, but still in the easy range. I'm not sure if I'm happy or sad the speed workouts are over! They weren't nearly as scary as I thought they'd be and I surprised myself with how fast I could run on the final intervals for the last 3 weeks. I do wonder if I am being too conservative in my pace target, but I think I'd rather be a bit conservative, avoid injury and get some confidence in my abilities rather than be too aggressive, maybe get injured and maybe depress myself when/if I couldn't hit the target. I missed my blog post last week. We were out of town and our internet was out all weekend to boot! So I'll only do a quick recap from week 8. Annoyingly, enough, the internet is being bad this weekend also! Anyway, said all that to say, I have decided to add a Picture of the Week segment to my training blog posts. The idea is for it to be a training run picture, but who knows! It could be anything. 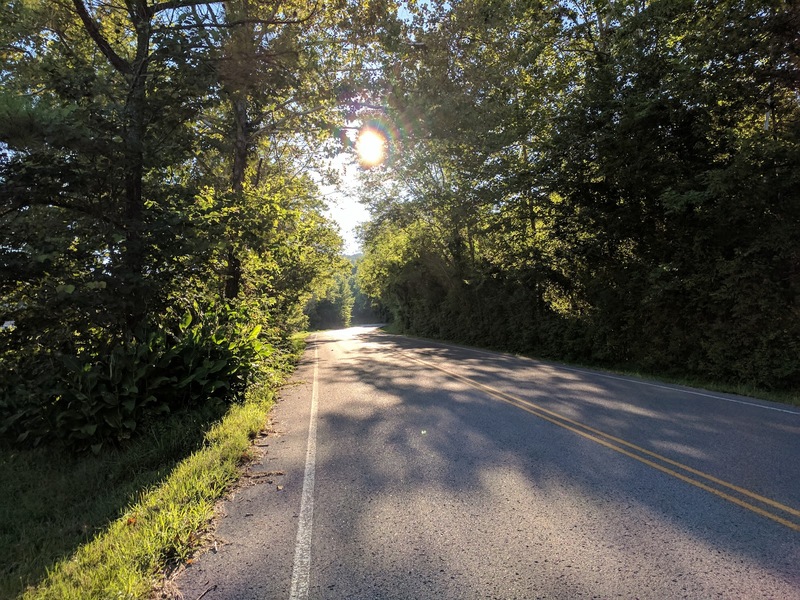 This week's is a picture I took on my Sunday morning run during my cool down. So blessed to have so much beauty around me! Sunday I did a run from the house on the road early in the morning. I usually don't like to run on our country roads, but Sunday AM is pretty quiet traffic wise, so I did an easy 5 miles. It was only 65 degrees and I was cold when I was in the shade. That's so crazy in late July!! In the evening, I did my first strength training workout using a Hansons 6 week schedule. It's supposed to be 3 times a week for 6 weeks, but I'll be lucky to do 2 a week. Still, some is better than nothing! Monday I did a 4 mile tempo run at River Park. I tried to not do the last mile faster than race pace, but I accidentally hit the lap button in the middle of my last mile and had to guess at how fast to do the last 3/4 mile to get that mile to come out alright. I guessed a little wrong and did the last mile at 11:34 instead of 11:49. The other 3 miles were spot on within a couple seconds. Tuesday was an easy trail run for 6 miles. I've been struggling with my easy trail runs, but this was an ok run. Not a great run, but ok. I used my Camelbak vest with the back bladder full. I had to put my phone in one of the drawstring pockets because the full back bladder pulled the zipper pocket too far into my arm pit for my phone to comfortably fit there. I'll have to play with the straps to see if I can fix that. Wednesday I went to Bowie Nature Park for my 10 mile long run. I nailed my average pace at 13:53/mi. I'm pleased that I can run that on a trail. I also did my second strength workout for the week. Thursday I hit the treadmill for 5 miles. 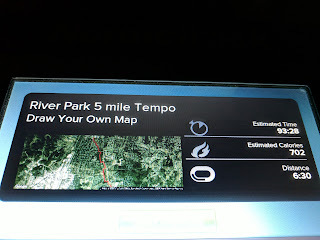 I originally thought this was a 6 mile run, so when I saw only 5, I was unreasonably excited about that. It was also nice to do an easy run not on trail. Turn treadmill and Hulu on, turn brain off, run. No worrying about terrain or twisting an ankle. Friday Speed run day! I really like speed runs. They make me feel like a runner! This time was 5x1000 with 400 meter recovery jogs. I did a 1 mile warm up, the intervals, then 2 miles cool down jog. My interval pace is my 5k PR pace that I set this year of 10:50/mi. 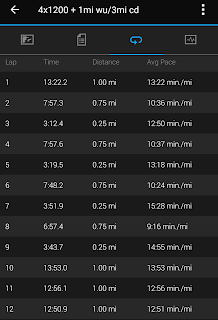 I did each of the first 4 intervals at 10:40/mi give or take and the last interval, I managed a 9:02/mi pace. Sometimes I think I underestimate how fast I can actually run, but I don't want any injuries, so I let myself run that last interval faster, but not the others. 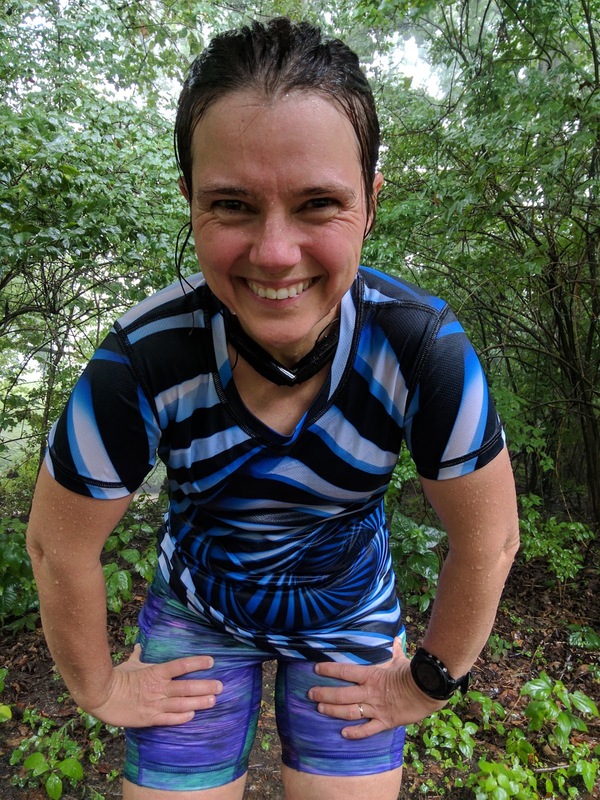 I got rained on in my last cool down mile, but it felt good, so I wasn't too concerned about getting more wet.